Kia’s Sorento might not be the first vehicle that pops to mind when thinking “midsize crossovers,” but it certainly should be on your mental list. Perhaps more likely to be considered is the similar — though not identical — Hyundai Santa Fe, a model name that has been around a lot longer. In fact, choosing between the two may come down to styling preference, dealer location, and perhaps some equipment differences. Our SXL included 19-inch alloy wheels, 360-degree cameras, and a hands-free power liftgate in its $46,490 base price. In the form tested, the Sorento came with V6 power, all-wheel drive, and three rows of seats for 7-passenger capacity. 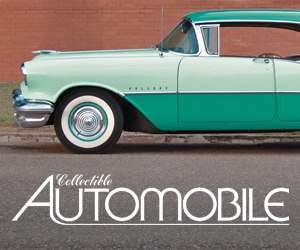 It also came with a host of features — some optional — that pushed its price to just under $49,000. If that sounds like a lot — and it is — it’s not out of bounds for a midsize crossover with this level of equipment. Aside from what you’d expect for the price, our test Sorento came with such upscale features as a Harman Kardon sound system, navigation system with 8-inch touchscreen, Nappa leather upholstery, dual-zone automatic climate control, heated and ventilated front seats with power lumbar support and driver-seat memory, heated steering wheel, keyless access and starting, adaptive cruise control, 360-degree cameras, a panoramic sunroof, and a hands-free power liftgate. 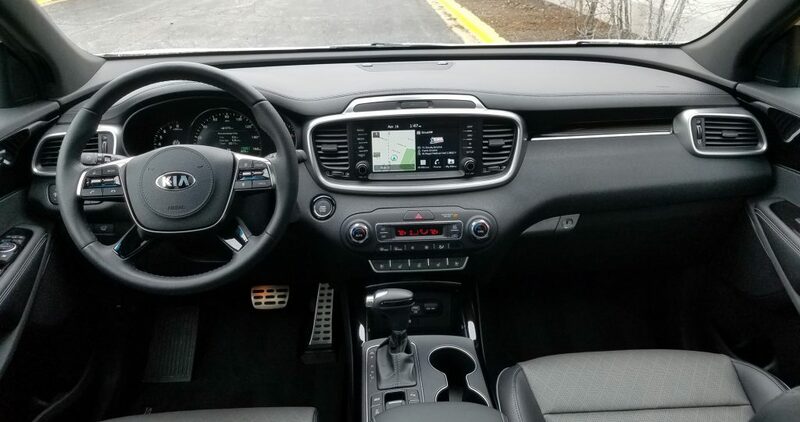 It also included a hefty list of high-tech safety features, including forward collision warning with pedestrian detection, lane-keep assist, blind-spot alert, and rear cross-traffic alert, along with Kia’s UVO eServices telematics system. 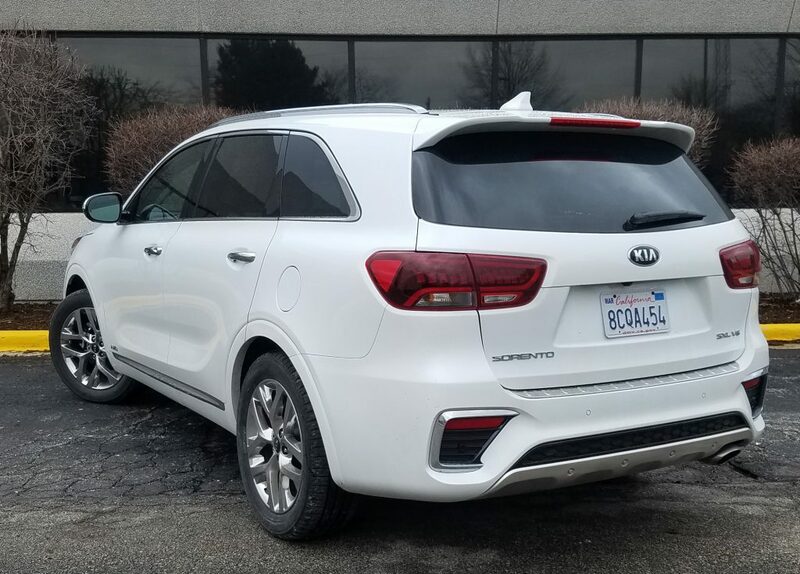 Although on the small side for a V6, the Sorento’s 3.3-liter provides fine acceleration; we timed it at 7.4 seconds in the 0-60 sprint, a good showing. Helping the cause is an 8-speed automatic transmission that kicks down fairly quickly when the throttle is stabbed from speed — though less so if the “Eco” setting is chosen, which dulls throttle response in an effort to improve fuel economy. The annoyance probably isn’t worth any benefit, however, even though we averaged only 20.3 mpg in 65 percent highway driving — though that isn’t really bad for a midsize, 3-row, AWD crossover. Ride and handling are fine, with the former proving quite compliant over our rough local streets. 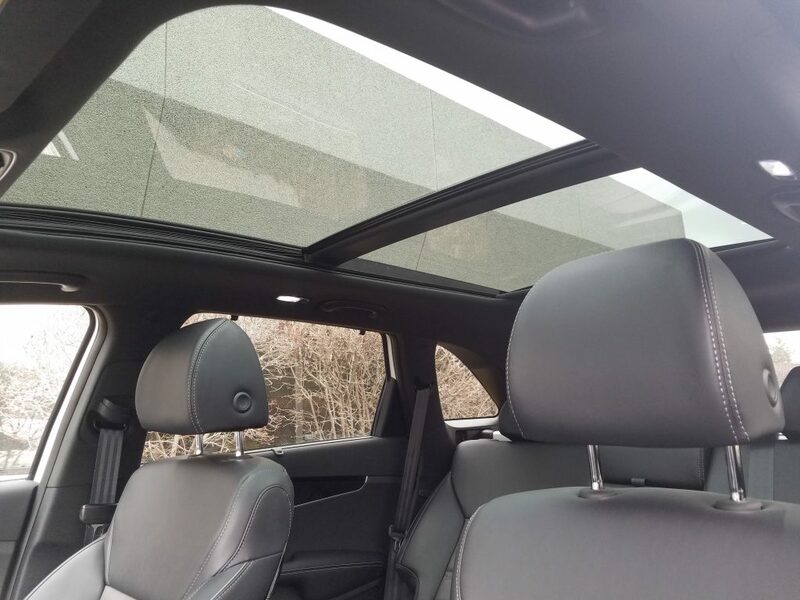 Also included in the SXL is a large, panoramic sunroof that allows rear-seaters to enjoy more light and a skyward view. 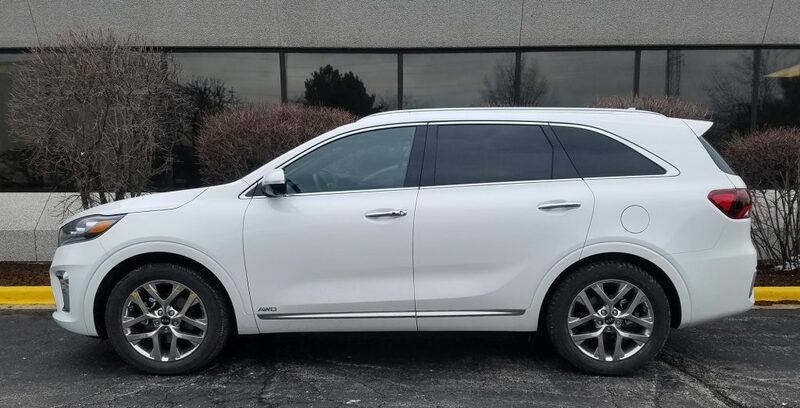 Sorento is fairly typical of midsize crossovers in terms of seating room — meaning it offers a lot of it — but a number of things are worth noting. 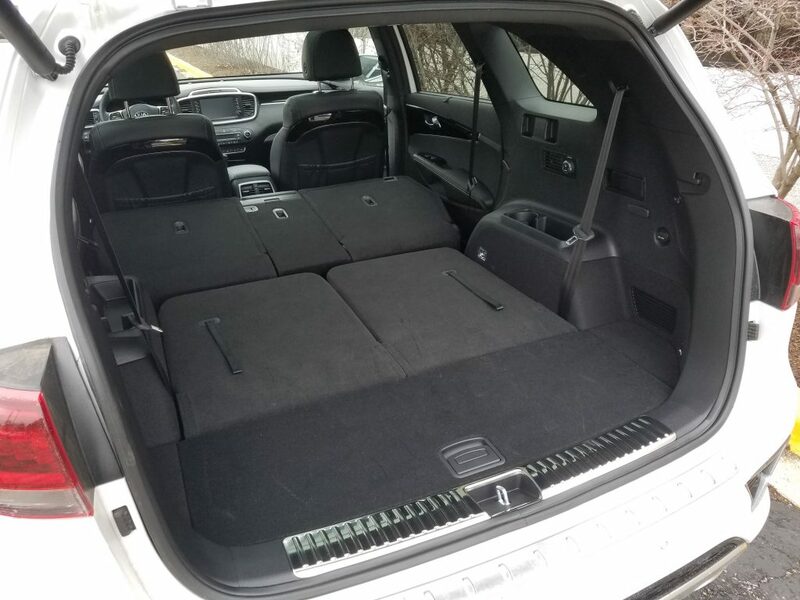 Both front seats in the SXL trim level are not only power adjustable, but offer power-adjustable lumbar support, an unusual nicety for the passenger. The second-row seat slides fore and aft about eight inches to balance legroom between the second and third rows, and it includes a reclining seat back. Also, the center floor hump is very low, giving decent foot space to a center-seater, and our tester included a large, dual-pane panoramic sunroof. While access to the third row is a bit tight, an average-size adult can get back there and have sufficient headroom and legroom (though with a “knees up” posture), and folks back there get separate climate controls. Visibility is good all around, aided not only by a wide-angle 180-degree rearview camera, but also a 360-degree camera with a convenient console-mounted knob to select the desired view — a really nice touch. The only down side is that while the third-row headrests fold to aid the rear view, the second-row ones do not — and block a bit to the rear corners. Although a bit bland in all-black guise, the SXL’s interior boasts some nice touches (such as aluminum-look pedals), fine materials, good storage space, and easy-to-use controls. Numerous interior surfaces are padded, but at least in the monotone black with piano black trim of our tester, the cabin looked a bit bland. Audio controls include volume and tuning knobs with eight physical buttons and an 8-inch screen, with climate controls consisting of dual rotary temperature knobs, but less-desirable repetitive-step pushbuttons for mode and fan speed. All controls are within easy reach. There’s a decent amount of interior storage space, highlighted by a 2-tier console box with USB plug, and a large forward console bin with Qi wireless charging pad under Aux/USB/ two 12-volt plugs — a really handy setup. Not only do the second- and third-row seats fold flat, but there’s a good amount of hidden storage beneath the cargo floor. In back, there’s the expected good cargo space with flat-folding second- and third-row seat backs. Less expected, perhaps, are the good underfloor space, 12-volt outlet, and handy hands-free power liftgate. Note, however, that the second-row headrests may need to be removed to fully fold the seat back if the seat ahead is pushed far rearward. Also note that a couple of items that might be expected at this price — a cargo cover and cargo net — had to be added as separate options. Largely because the midsize-crossover class is very popular and growing more so, there are any number of great vehicles in the segment. 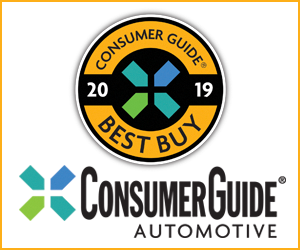 While we award Best Buys to the well-known Honda Pilot and Toyota Highlander — both worthy recipients — any number of other vehicles in the class (we count a total of 17!) may offer specific features you want at a better price, and the Kia Sorento could certainly be one of them. 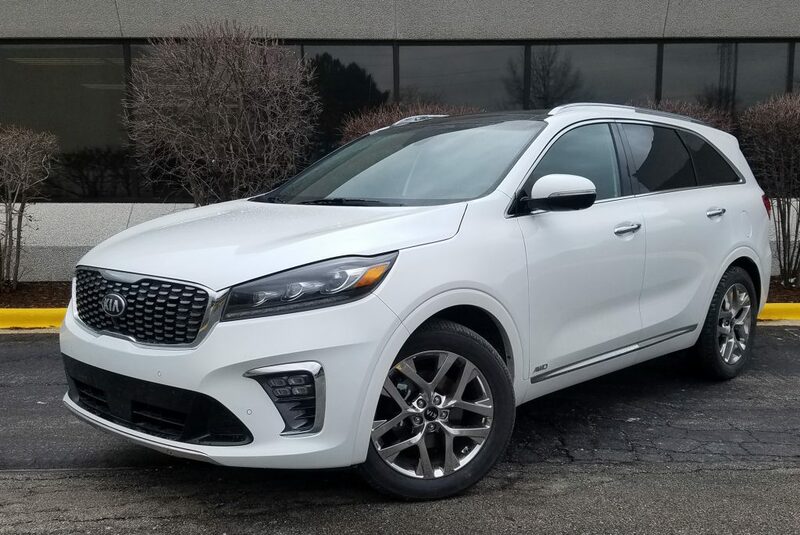 We wouldn’t fault you if the Sorento made your list based on looks alone, but there are more practical reasons it should be taken into consideration — perhaps among them being that you won’t see one on every street corner. Written by: The Daily Drive staff on June 29, 2018.